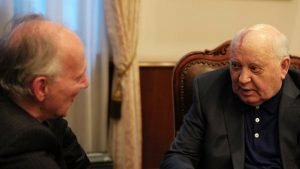 Werner Herzog’s poetic documentary paints a rather rose-tinted picture of Mikhail Gorbachev – but impresses on the personal level. Reviewer David Dannreuther attended a private screening of Meeting Gorbachev on 6th November 2018 at the University of Westminster’s Regent Street Cinema. Andre Singer was commissioned by MDR Germany to produce a documentary on Mikhail Gorbachev, and decided to recruit world famous film director Werner Herzog to confront the former General Secretary of the Communist Party of the Soviet Union. The film is written and narrated by Herzog – who thought of the film as a work of poetry rather than a historical documentary – and is primarily a conversation between Herzog and Gorbachev interspersed with archive footage. As such, viewers may be disappointed on the historical level if they are seeking enlightenment on what actually happened in those cataclysmic years when the Iron Curtain came down, the Soviet Republics became independent and nuclear disarmament signalled the end of the Cold War. This for many might be seen as a lost opportunity when access to one of the few remaining players is difficult to obtain. There are reasons, however, for the film turning out as it has: Herzog’s gentle style of interviewing, his obvious admiration for Gorbachev, his view of his film as a work of poetry, Gorbachev being 87 and Gorbachev remaining a wily diplomat when responding to Herzog’s questions. Nevertheless there are some very clever insights – particularly from Horst Teltschik (national security adviser to West German Chancellor Helmut Kohl) – which will delight the most critical historian. It is however on a personal level that the film is most impressive. It shows Gorbachev growing up, informs us of his brilliant academics, his rise up the party hierarchy and illuminates his relationship with his (quite devoted) wife and relatives. The photography and filming are quite superb and the filmmakers have had access to an enormous archive which brings in the thoughts of Gorbachev’s contemporaries. However the prevailing feeling is one of sadness: Gorbachev lives alone in Moscow, his beloved wife Raisa dead, he is seldom visited and he is disliked by Putin and many Russians for dissolving the Russian Empire.